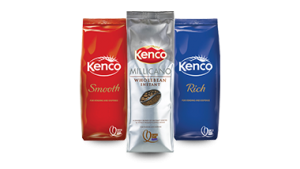 A brand of coffee customers know and love, the Kenco brand is synonymous with superior taste and superior quality. We supply a range of instant products that can either be used in several of the Kenco Coffee Machines, or simply with the Kettle. Gives you all the reassurance that the hot drinks you serve are quality from aroma to taste. They’re ideal for use in medium and large throughput sites with each 300g bag making up to approximately 214 cups (1.4g per cup).